Well, it may be painfully late, but it’s here: the August Metagame Breakdown. This month we saw a rash of major events culminating in the triple Grand Prix weekend confirm what the metagame had tentatively established in July. There were no changes in the Tier 1 lineup from July to August, and we actually saw some of the decks that were furthest ahead extend their lead. Frankly I found this lack of movement way more surprising than I would have any upsets—apparently the Modern community at large had already figured out the metagame writ large before the pros and semi-pros got their hands on it at the respective Grand Prix and SCG Opens. So what does that metagame look like? It’s mostly linear, as befits Modern, with Jeskai Control, Bant Eldrazi, and especially Jund preying on the non-interactive decks. In some ways Jund is the story of the month yet again, easily claiming the top spot with a 10.2% metagame share. The next in line, Burn, only takes up 6.6% of the field, with Affinity, Eldrazi, and Infect hot on its heels. That’s starting to look a lot like a clear case of “best deck,” but as with all things Modern, the jury is out on how long it will last. From a theoretical standpoint, I really like Jund’s positioning in a field of linear decks. It’s one of the few decks simultaneously capable of dismantling non-interactive decks while still smashing any rogue or non-tiered strategies that may appear with its card quality and efficient threat base. Meanwhile its natural predator, Tron, is at a local nadir. Another deck that seems well positioned is Bant Eldrazi, for similar reasons. We see it jump almost 2 full percentage points from July. Like Jund, this deck combines undercosted threats with flexible disruption, and is quite adept at picking apart linear stuff while presenting a serious clock itself. The month of August saw a return to a hearty number of major events, capped off by the triple Modern Weekend in Guangzhou, Indianapolis, and Lille. These were flanked by two Star City Games Opens in Syracuse and Somerset, as well as the mixed-format SCG Invitational. While Day 2 metagame data was unavailable for the Somerset Open, we were able to include data from the Invitational that took place the same weekend and in the same location. I elected not to include Top 8 finishers overall, as unlike comparative mixed-format Pro Tours, Modern is weighted exactly the same as Standard for final standings. What represents a much better measure of performance are the 7-1 or Better Modern Decklists, which were weighted equally to the Top 8 and Top 16 decks from the Opens at large. Combined with the smaller paper events, among them many PPTQs from around the world, we have a total of 92 events with 693 decks. The MTGO League data seemed to be missing two days (the 26th and 27th of August). I was unable to determine if no League results from that day were published, or (what’s more likely) they met their demise at the hands of a hiccup in Wizards’ publication software. Either way, two days shouldn’t have a profound impact on the data. These League finishes appear alongside a MOCS tournament, for a total of 29 events and 310 decks. As always, the online and paper metagame shares are combined using our tiering algorithm, which you can read more about on the Top Decks page. Finally, a note on naming. I’ve been getting more familiar with the different ways deck names are reported, and the more I learn the less satisfied I am with our database. I’ll try to explain my particular choices below as they become relevant to discussion of the respective tiers. For next month I hope to have a much more rigorous classification scheme, which we’ll unveil then. Tier 1 decks are the ones you should expect to face at every Modern tournament. Make sure you show up to your local events and Grand Prix alike with a well thought-out plan to beat these decks—you’re going to face them often, and each one is resilient enough to fight through a lackluster counterplan. Of course another avenue is to pick one of these up yourself, which I generally suggest for anyone not well-versed in a lower-tier deck. Whether you know one of these archetypes inside-out and can tune a killer sideboard for the field, or you want to pick up something new and wing it, these decks certainly have the chops to get the job done. If this lineup of Tier 1 decks seems familiar, it’s because it is—the Tier 1 August roster is identical to that of July. This is surprising given the uptick in major events, which I and others expected to separate the over-hyped decks from the truly excellent. It would appear that the paper and MTGO grinders got things more or less correct, and GP participants showed up largely with the same group of decks that characterized July tournaments. For Dredge and Death’s Shadow Zoo, the loud newcomers from last month, MTGO and paper shares evened out in August—indicating both the adoption of tech from MTGO results and adjustment to other decks to better prepare for these archetypes. Seeing them both even out to normal numbers across the board reinforces the narrative that they’re here to stay as a competitive, but non-dominant, part of the Tier 1 metagame. That isn’t to say no changes of any kind took place, but they were relegated more to specific builds. The two decks that exhibited the most innovation were Jund and Death’s Shadow Zoo—while more traditional builds still show up in healthy numbers, for both of these archetypes a new version seems to be creeping into the standings. It’s still too early to tell to what extent these are “brews of the week” using the new cards from Eldritch Moon, and to what extent they form the new standard of the decks in question. In the case of Jund, we’re talking of course about the addition of the new darling, Grim Flayer. This card has also shown up in Abzan strategies, and some enterprising Jund pilots even tried to splash a few Lingering Souls to get max value off of the self-milling two-drop. Note that I reported all of these decks as “Jund”— there was a gradation between traditional Flayer-less builds, to builds running one or two, to builds like we saw at the World Championship that maxed out on Flayer alongside other cards like Mishra’s Bauble to enable it. If the four-color versions could technically be called “Ajundi” or the like, Liliana of the Veil and Grim Flayer team up admirably to allow their pilots to eschew white mana entirely when casting Lingering Souls. These decks ran precious few actual white sources, and were distinctly lacking in white cards besides Souls, even in the sideboard. Thus I feel the Jund moniker is more accurate. I wrote about Grim Flayer earlier this month, and I stand by what I said then. I think this is just one more tool in the BGx player’s arsenal, to be brought out when it’s suitable to the meta and shelved when it isn’t. I don’t think we’ll see a complete abandonment of the new tech, nor its resounding takeover. It is possible, of course, that I’m wrong and the hype behind Grim Flayer peters out, or alternately proves itself as The Truth in Jund or Abzan decks. We shall see how the cards fall, but I’m taking the conservative neither-nor approach for now. As for Death’s Shadow, two new versions reared their heads during August. The first one is a streamlined Jund-colored build that cuts Steppe Lynx, usually for some copies of Gnarlwood Dryad. These decks run the gamut from traditional Death’s Shadow Zoo sans hideous mana base, to an innovative new delirium-centered build sporting 4 Traverse the Ulvenwald and no Become Immense. The delirium builds, exemplified by Luis Scott-Vargas’s and Josh Utter-Leyton’s decks from the MOCS, push the archetype in a truly different direction. 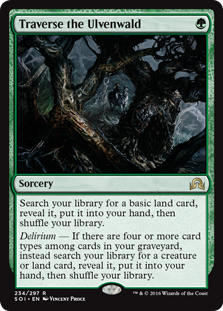 Assuming delirium is turned on, they gain access to twice the number of effective Death’s Shadows (the best card in multiple matchups), and a tutor package consisting of Inner-Flame Acolyte, Ghor-Clan Rampager, and Bedlam Reveler. With better mana, a bonafide late-game the archetype has rarely been able to boast, and the potential to smooth out draws, this new build seems much more “stable” and consistent than traditional Death’s Shadow. That said, it has sacrificed explosiveness for the privilege—and Become Immense has to be sorely missed in matchups where racing is what matters. The second variant, a Grixis shell using blue cantrips (and usually Kiln Fiend), really starts to resemble a different archetype. These decks, which I’ve labeled “Grixis Death’s Shadow,” had too few representatives to appear anywhere on the tierings. Experimentation with this build might help explain Death’s Shadow Zoo’s slight drop in metagame share as I have reported it. The main thing I notice looking at changes to Tier 1 is just that there is significantly more overall positive movement than negative movement. Ascendant Tier 1 archetypes gained a total of 4.5% metagame share, while the ones that dropped only lost a total of 1.8%. This necessarily means the metagame share was ceded largely by Tier 2, Tier 3, or lower archetypes. In other words, the Tier 1 of Modern ossified somewhat last month. What this says to me is that these decks truly are the best of the best in the current environment, and everyone’s starting to figure it out. As less doubt remains regarding which decks are the best options for winning tournaments, more players gravitate towards them. That’s not to say things are set in stone, of course, but for now it appears the formula is go linear, go Eldrazi, or go Jund. And boy howdy, does Jund ever continue to shine. Again at the top, again pushing a full 10% of the metagame. This is the premier police deck of the Modern format, excellent at dismantling proactive creature- and spell-based strategies alike. If there’s anything preventing the mass of non-interactive decks from running completely amok, it’s Jund—buttressed somewhat by Jeskai Control and Bant Eldrazi. The former is still trucking along in a police role similar to Jund, enjoying its renaissance brought about by the printing of Nahiri, the Harbinger albeit at lower numbers. The latter gained nearly 2% in August to lock in its claim on Tier 1. Eldrazi isn’t entirely fair, exactly, given its occasional fast-mana draws, but it does aim to interact with Drowner of Hope, Eldrazi Displacer, and Thought-Knot Seer. I hesitate to call it a “police deck” as turn-three Reality Smashers are truly the stuff of (tentacled) nightmares, but it does seem to help keep other unfair strategies in check. We’re seeing a strong homogenizing tendency in Eldrazi lists, which are now overwhelmingly of the Bant variety. Just about every other color combination appears from time to time, but the second place for most numerous, Eldrazi Tron, outnumbers all of them combined. It appears Bant Eldrazi and Eldrazi Tron are the builds the community has settled on, and I see no reason not to report them as separate archetypes moving forward. A similar argument can be made for the BW Eldrazi and Taxes shell (reported in the data as Death and Taxes) which has become very uniform as well. Tier 2 decks are not as omnipresent as the Tier 1 crop, but they still show up in hearty numbers at the typical tournament. In many ways this tier is the lifeblood of Modern, whence its diversity and “play anything” reputation stems. If these decks aren’t dominating at the moment, they’re still capable of crushing a tournament on any given day—and most of them have been Tier 1 at some point in the past or will in the future. The better acquainted you are with any one of these archetypes, the better choice it represents, and if one of them is your specialty there’s a strong argument to stay the course and keep sleeving it up. As for preparing to beat Tier 2 decks, you don’t need to dedicate specific sideboard space or do backflips to make your matchups favorable, but at minimum have a plan. You won’t face all of these decks in a tournament, but you’re all but certain to face at least some of them. Welcome to Modern! Here again, we don’t see many radical shifts. RG Tron and Abzan varieties continue at the top of Tier 2, with the typical cast following on their heels. The main changes are Elves and Titan Breach having supplanted Living End and Gruul Zoo from their Tier 2 standing during July. Elves only shifted up by 0.1% and could just have easily fallen on the other side of the tiering during either month. Gruul Zoo lost a bit more, about half a percentage point, but still rests near the top of Tier 3. Neither change is earth-shattering. The two larger upsets are Titan Breach and Living End. Living End is off the map entirely, falling from 2.2% in July to sub-Tier 3 levels in August. My best guess is to attribute this outcome to splash hate from Dredge’s rise. While Grafdigger’s Cage still gives Living End a free pass, plenty of players have been upping their Rest in Peace and Leyline of the Void counts in sideboards. Living End is not exactly what you’d call a resilient combo—it’s unlikely to weather this kind of sustained hate, unlike its Tier 1 graveyard-based kin. Titan Breach doubled its metagame share from July. Some part of this change may be due to inconsistent reporting last month, but I can say confidently that all the decks under this umbrella in August are correctly identified. Each one shares a core of 4 Primeval Titan, 4 Through the Breach, and 0-1 Scapeshift. My classification system this month put the non-Breach Valakut variants in the Scapeshift category. These decks probably share more in common with the other RG Valakut strategies, and I am leaning towards rolling them into one category next month. Even with the more restrictive categorization, Titan Breach comes in at a robust 2.6%, solidly above Scapeshift’s 2.0%. This makes a lot of sense in a format as linear and noninteractive as today’s. The explosive, get-you-dead-now Valakut strategy is outperforming the durdly slower build. My best explanation for why it didn’t succeed before is simply because decklists were sub-par—old staples of the archetype like Emrakul, the Aeons Torn and Summoning Trap have become quite rare, and the archetype seems to have settled into one or two more refined consensus builds. As for Abzan and Abzan Company, another footnote on my classification scheme is in order. A new Abzan combo shell built around Eldritch Evolution has arisen of late. In many ways this new deck mirrors the old Pod decks of yore, and it also has much in common with Abzan Company. That said, two major differences makes me hesitant to include it as the same deck: 1) These decks almost always replace the Melira combo with the Archangel/Spike Feeder combo; and 2) they eliminate Collected Company entirely. So for now I included them as part of Abzan, but they probably share even less in common with the Siege Rhino/Liliana of the Veil deck. This helps explain why Abzan and Abzan Company have switched metagame shares from last month. My guess is some Abzan Company players are transitioning to, or experimenting with, Abzan Evolution. Note that the Eldritch Evolution tech has been more conclusively adopted by Kiki Chord—virtually every copy in our report data ran a full set of the new tutor spell. A final note on Death and Taxes. That 2% includes all versions of what is usually called “Hatebears.” What these decks share in common is Thalia, Guardian of Thraben and Leonin Arbiter (both usually as four-ofs), alongside a suite of other aggressive or disruptive creatures, and Aether Vial in most builds. The considerable variety across this family of archetypes probably hasn’t obfuscated its true metagame share because GW Death and Taxes just isn’t that common. Either way, I intend to keep them together in future reports as well. As for how to classify these families of archetypes moving forward, your input is welcome. On one hand I want our classification scheme to give credence to the legitimate strategic differences that one or two critical card choices can engender. On the other hand, it would be a shame if certain viable decks weren’t appearing on the standings because of cosmetic differences splintering their results. I see this as an ongoing conversation among the Modern community, so let us know your thoughts in the comments below. Tier 3 in Modern houses the decks with fringe potential, or those which are simply in a poor position in the current metagame. These decks range from relatively strong decks with scant adoption in the player base, to fragile decks that crumble to variance while mainstays like Burn or Jund draw consistently round after round. That said, Modern draws from an absurd well of card power, and each of these decks can give you a run for your money. You don’t need perfect knowledge of everything they’re doing, but the difference between familiarity and complete ignorance can definitely determine the outcome of a match. Playing these decks isn’t advised, unless you know them inside-out or have some specific reason why you think they’re underrepresented. Of course, they are also worth a look as fun decks to battle if you’re less concerned about winning and want to delve into the deeper end of the Modern pool. There’s usually more movement in the lower tiers each month, and August was no exception. The main decks that dropped off this month were Esper Control and Faeries, replaced by Griselbrand Reanimator and Mardu. Griselbrand (encompassing both Grishoalbrand and more controlling builds) didn’t see tons of play overall and was supported largely by its Top 8 appearance in Guangzhou. On the other hand, Mardu Control/Midrange has been gaining steam. The August numbers don’t represent any one high finish that could be called an outlier. Mardu is certainly the secondary choice for people looking to exploit Nahiri’s ultimate, behind Jeskai Control, but it has proven itself as a lower-tier deck in its own right. As Esper disappears, UW Control doubles its share. Perhaps splashing black is not worth it in your durdle control deck? The UW Control decks contain a significant tempo plan in many cases, and have often been reported as “UW Flash.” Restoration Angel and Snapcaster Mage are often joined by Spell Queller, whose addition to the archetype might be what’s helping it up. This is another family of archetypes (along with Jeskai Midrange and other Geist of Saint Traft decks) whose classification I intend to shore up next month. Pyromancer Ascension, which I more or less expected to disappear this month, actually rallied to double its share from 0.3% to 0.6%. That isn’t much to write home about, but the 1.9% MTGO shares may be. In July we saw Dredge and Death’s Shadow foreshadow their later adoption in paper in the faster-moving MTGO metagame. Perhaps Ascension will follow a similar trajectory (albeit in a lower tier). At this point I’m inclined to believe Pyromancer Ascension has cemented its Tier 3 status, for the time being at least. I feel like apologizing once again for this article’s tardiness, but then words are pretty cheap. I realize many of you rely on our metagame data to inform deck selection, especially for large events, and I haven’t been delivering on that service in time for it to be relevant. For next month I will be entering the data much more in advance, which will help get me on schedule. Either way, you’ll have to wait until then for me to make good on my pledge. The goal moving forward will be a Metagame Report on the first Wednesday of each month, so that it can be a useful guide for deck choice during any given month. Let me know of any lacunae in my analysis here, as well as any concerns, questions, etc. you may have, in the comments. I’m also interested to hear any opinions on what decks should be grouped together under a single archetype name. As always, thank you for reading. Where can I find a decklist for one of these Pod-esque Abzan Evolution decks? I’m curious about any deck sporting Eldritch Evolution, and would like to have a look. 1. It’s interesting to see that in general Tier 1 decks are picking up more steam, but it’s also interesting to note which Tier 1 decks are taking a step back. I think Jeskai Nahiri’s downturn is in part due to the hype wave wearing off, but can we say the same about Death’s Shadow Zoo? I suspect that it will settle somewhere in Tier 2. It excels at attacking durdly decks, but there aren’t that many of those around anymore. 2. I agree with your decision to keep the D&T variants together. It’s clear that despite their differences, they are following the same basic gameplan. This also is more informative in the sense that together they compose a Tier 2 metagame share, which means that decks overly soft to their wiles (looking at you, Scapeshift) might have a tough time in bigger tournaments. 3. I’m surprised to see Abzan Company and Kiki Chord still hanging around in Tier 2. Grafdigger’s Cage and other forms of graveyard hate is everywhere, but the Cage in particular shuts those decks down hard. I suppose they’re pretty good when the hate doesn’t show up, but their hanging around at ~4% of the Modern meta when combined is a bit unexpected. 4. Gruul Zoo’s dip to Tier 3 surprises me. I would have thought it’d be in a good position to punish Death’s Shadow Zoo, Infect, and all those other self-damaging linears, but I suppose its overlap with Burn is affecting it? Not sure. 5. Soul Sisters’ resilience in the Tiered ranks is impressive. Not sure what to make of it, though. I am not a writer for magic, but if it does not bother you unduly, then I shall present my thoughts on your questions. 1) I personally believe that Death Shadow will occupy a similar position to Infect. However, it will, in my opinion, be slightly worse. The deck is a lot more likely to improve than infect, though, as it is easier for a card to slot into Death Shadow than infect. 2) I agree with you. 3) Kiki Chord’s persistence may have something to do with it being as very skill intensive deck, and that once you know your deck, you don’t want to put the deck down, as you spend quite a bit of time learning. For example, I have been playing a straight Selesnya Chord evolution deck, and I don’t want to put it down, bad positioning be darned. 4) It is entirely possible that all the Gruul deck people just switched into death shadow. 5) Soul Sisters is a decent deck, but there will always be a segment of the population who will always play the life gain deck, thus accounting for it always being played in some numbers. Here are my thoughts. I’ll editorialize a bit here, as I have opinions on deck strength just from playing Magic. All shall be taken with the requisite grain of salt, as I don’t play these decks. Jeskai Nahiri: I don’t think this deck was overhyped (except for perhaps one or two weekends). It has put up consistent numbers since the ban, and the downtick has been gradual. I’m unsure what is causing its retreat, but I think it’s contextual metagame considerations, not that the deck is falling flat. Company/Chord decks: These variants have always excelled at playing a fair, value-based attrition game. I don’t think their persistence is a fluke. They have a solid Plan B and don’t just fold to Cage. Gruul Zoo: Some of my friends would disagree, but I’ve always found this deck lacking in power. Not sure why we want to beat down with vanilla 2/2s and Bushwhackers when we could be casting Lava Spike and Eidolon of the Great Revel. Personally I think this is just a bad version of Burn, but I could be wrong. anything that runs a core of thalia, leonin arbiter, ghost quarter, and path to exile being reported as “Death and Taxes”. I do think it would be helpful to note, however, if the G/W version of the deck which doesn’t run Aether Vial becomes popular, as that is a substantial change. on a completely different note, DnT players don’t really have a consensus as to whether 3 or 4 thalia is correct. frequently mono W lists run 5 copies of that effect between actual thalia and vryn wingmare, but outside of that it appears to mostly be preference. it only posted half of my comment. Basically I said there was a difference between hatebears/DnT but for metagame breakdown I like this method better. It helps make the archetype stand out more despite heavy variance between decklists (which is a good thing for DnT). Great article Jason! I am glad to hear we are adjusting the schedule too. It surprises me to see Jeskai still in Tier 1, as Sheridan seemed to suggest Bant Eldrazi would be the only blue Tier 1 deck (that was at MtgSalvation though). As for you 2 days of missing data: check the Deck List page on WotC’ page again, on August 29th they published 3 articles, those are the August 26, 27 and 28th decks. Cheers, keep up the good work guys! I love reading these articles and I can’t wait to read the next one. Wow did Living End just fall of the map completly now.